Abandoned buildings line Kensington Avenue near East Monmouth Street. 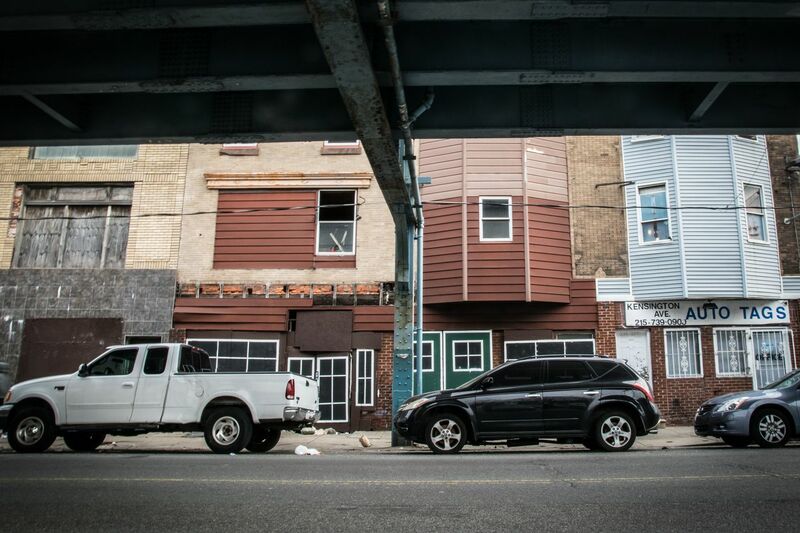 While Kensington and Philadelphia as a whole face unique barriers to making sure all residents have quality housing, the issue is not exclusive to the city. Here’s a look at how other places are reducing the number of people experiencing homelessness in their communities. Well House: Grand Rapids, Mich.
Well House, a nonprofit based in Grand Rapids, Mich., purchases abandoned buildings and involves the community in rehabilitating them into affordable, long-term homes for people without housing. Since Well House began restoring buildings in 1977, it has converted 13 houses into safe living spaces and housed approximately 5,000 people. Residents can rent a private room in a Well House property indefinitely. Rent ranges from $300 a month for individuals to $400 a month for two people. Those payments include utilities, food grown on the property, and access to staff who can connect tenants to other services. John Glover, the executive director of Well House, said that each property acquisition involves negotiating with land banks and working with the private sector, foundations, and community organizations. Well House is funded through grants, donations, fund-raising, tenant rent, and farm income. According to Glover, providing long-term housing addresses the needs of those who live on the margins. While Glover said that many shelters offer a wealth of services and exceptional work, he also saw how complex those environments could be for those living there. Instead of rejecting potential tenants because of their past or present struggles, Well House welcomes them to the community. All that matters is that tenants pay rent and are respectful to their housemates and Well House staff. Glover said that rehabbing the buildings is the most challenging part. Despite the hurdles, preserving community history is part of the Well House philosophy. The renovation process also brings together community members, residents, and often times those who will be living in the houses. This model, Glover believes, can work in any city as long as people are dedicated to making it happen. For eight years, Andrew Lunetta worked in shelters, where he saw an immediate need for affordable long-term housing options. According to Lunetta, when people moved from a shelter into affordable apartments on the private market, the units were often infested with vermin or otherwise not livable. Tenants often cycled in and out of the sheltering system for years. He decided to take action by raising the money to build tiny homes that could serve as long-term housing for those experiencing chronic homelessness. One reason the homes are successful is that they blend into neighborhoods, Lunetta said. The organization scatters the homes in vacant lots across the city instead of concentrating them in one location. Lunetta explained that this helps mend the disconnect some residents have with those who have experienced homelessness. Made possible by donated lots and volunteer effort. the project also benefits from Syracuse having low taxes and low building costs. In 2016, the City of Boston established the Boston Way Home Fund with the goal of raising more than $10 million in private and public funds in four years to create 200 units of permanent housing for people without homes. Since then, the program has housed 1,400 people, most of whom are veterans or people who have experienced chronic homelessness. The fund’s implementation also led to the city’s streamlining its system of providing services to those experiencing homelessness. Pine Street Inn, a nonprofit partner of the fund, focuses on getting people out of the shelter and into appropriate housing as quickly as possible. This includes moving people into permanent supportive housing or rapid re-housing, and providing rent assistance or housing vouchers. Those working with individuals in the shelter have seen that many people come in as they’re transitioning out of health-care or criminal justice systems. Others need help connecting to long-term care. As the fund’s partners determine the needs of those experiencing homelessness, the city will continue pushing to raise money to create solutions based on those needs. Jordan Holycross is a journalist and student living in Philadelphia. A version of this piece previously appeared in the Kensington Voice, a community-driven news initiative that amplifies traditionally underserved voices, illuminates the neighborhood’s complexity, challenges, and resilience, and explores existing and potential solutions to problems facing the heart of Kensington.